It's been quite sometimes I did not post any recipes here. Well, haven't had enough time to take pictures of all those food I have cooked should not stop me for sharing more Indonesian food recipes indeed. Surely I have many favorites Indonesian food that my family love to enjoy in cold, winter days. Including those delicious ones for your festive day! And this time, I have semur daging dan telur - egg and beef Indonesian stew. It's more like a free translation of it. So if my Indonesian friends have better term or translation for it, please let me know :). 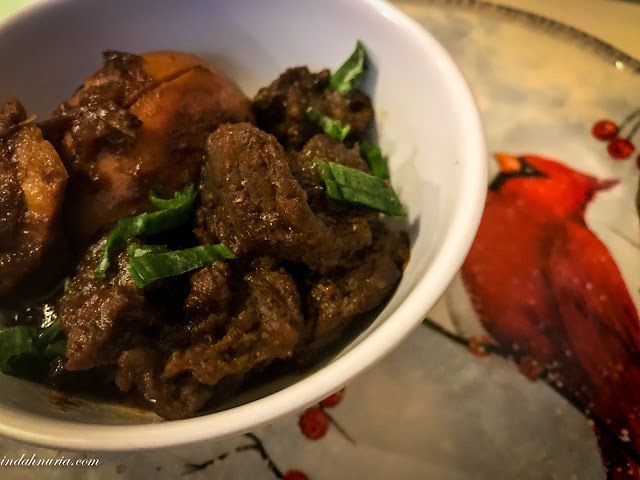 We love semur because of its exquisite taste. A combination of beef or chicken broth with palm sugar, sweet sow sauce and traditional spices like nutmeg and coriander is indeed delicious. I don't know exactly where this menu is originally from but I guess almost every Indonesian is familiar with this. Either you cook it with beef or chicken, and add some extra eggs, tofu or potatoes, it all blends very well and you can get everything ready to eat it together with rice. Of course, slow cooking is best because all the spices will be well blended and the meat will be soft and tender. So, enough with the introduction and let's cook. Beef - 2 pounds, cleaned and cut into cubes or as desired. 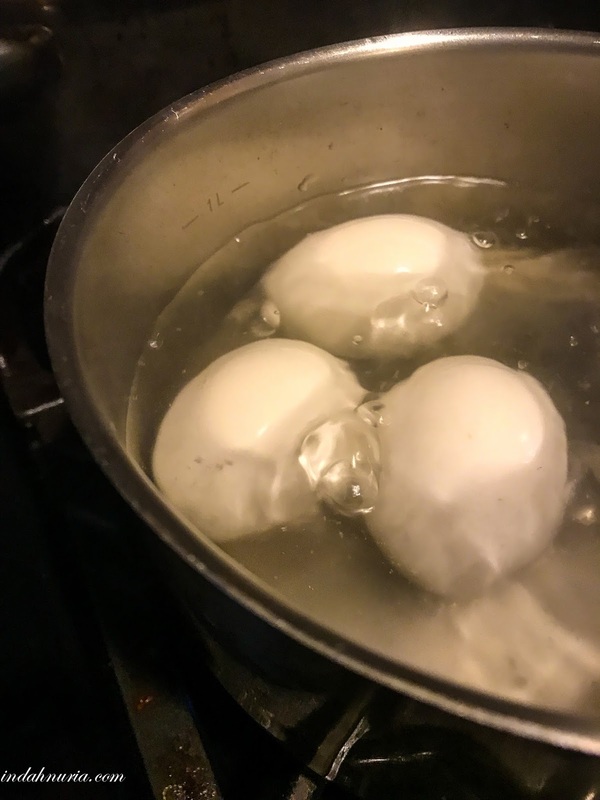 Eggs - 4 or less, hard boiled and peeled. A bowl of steam rice. Just a little note that in some recipes, they use coriander, some do not. You are indeed welcomed to use it as it brings an exquisite aroma to the soup and it blends very well with the beef. I. But I make sure that nutmeg is added as it is delicious! Some also like it with extra soup, while I love it with less watery soup but more like the thick sauce after the slow cooking. Whatever you prefer, they all taste wonderful! First, we get all the spices ready. 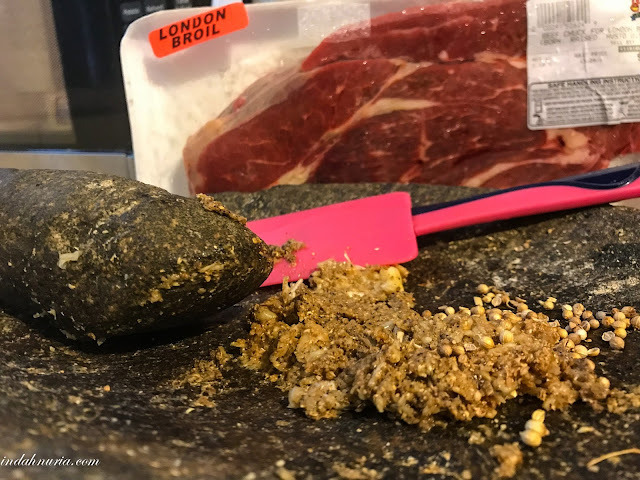 Using mortar and pestle (traditional way is the best way for me :)), grind the garlic, shallot, coriander and candle nut. Of course you can and are welcomed to use your food processor. Then heat one spoonful of vegetable oil and sauté the ground spices until it's well cooked and fragrant. The spices will look gold and you can tell when it is adequately cooked. In a large pot, boil the beef, together with the spices, until it is soft. I takes around 3 hours or less to get it tender, depending on the type of beef you are using. Once the meat is tender, put the hard boiled eggs and boil it together for 15 - 20 minutes to ensure the spices are well blended with the eggs as well. Don't forget to add the Worcester and sweet soy sauce along the way. Make sure you have enough soup and add the water as you boil the stew together. Once the beef is tender, you know Semur Daging dan Telur - Egg and Beef Indonesian Stew, is ready. eat with a bowl of steam rice and it's yuuum! The best way of eating it is together with a bowl of steam rice. It will be great to enjoy this for your holiday dinner or lunch. Hope you enjoy it as much as we do and bon appetit! Mbak, ngomong-ngomong tentang semur, jadi inget semur jengkol. Sebagai pencinta semur, cukup bikin ngiler juga melihat foto semur buatan mbak ini. Etapi gak semua orang suka jengkol juga sih. This looks like a really delicious recipe, Indah. I know my husband would be thrilled if we had this on the dinner table. 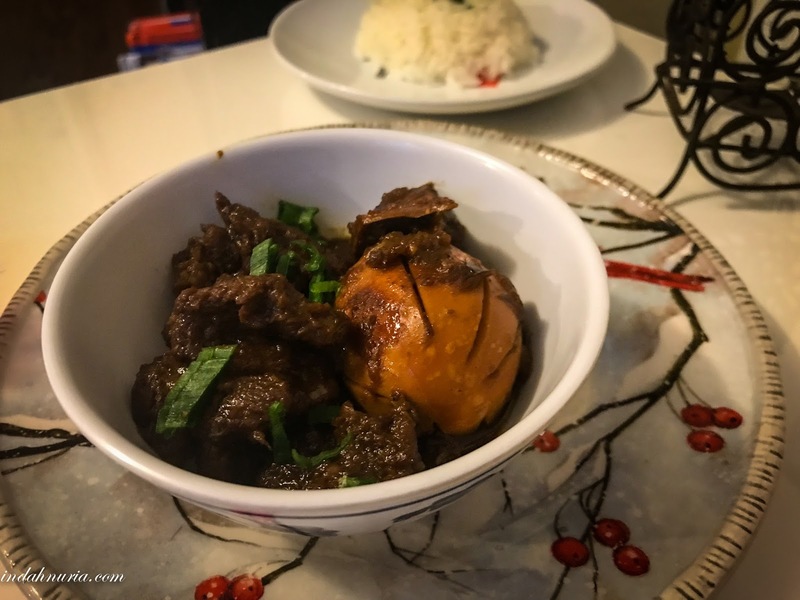 Wow..penampakan semur dagingnya menggoda lidahku Mba..
Semur is nice! So easy to cook and many people love it! This does look good! I'd love to make it. I wish the grocery store wasn't so busy! love this! I keep eating it whenever you have it! Pecinta semur garis keras merapaaat! Mantap bener dagingnya, pastinya maknyos tuh. Cocok banget buat makan siang, semur emang juara.